Many veteran booksellers got a good laugh a few years ago when a young book “sorter” for a large on-line used and rare book vendor was quoted in a newspaper as implying that he, having sorted thousands of books for a few months in his tenure there, had essentially seen all there was to see when it came to rare books. Most of the rare booksellers I know and respect thrive on the working assumption that there is a lot of undiscovered country out there. In fact, not only is that voyage of discovery the fun part of the job, happily it can also be the lucrative part. Here at BTC we always have a few catalogs in the works simultaneously, and the other day Matt was doing some preliminary editing for our next African-Americana catalog. We have a rare, in fact almost unique 1910 African-American cavalry book and Matt, wanting to check some things about Tom’s description, got the book in hand. Going through it carefully Matt called out to Tom and me, “There’s a poem in here by Alfred Damon Runyon – isn’t that significant?” The poem had previously escaped our attention, and significant it was. In fact, the poem, about a parade of African-American soldiers, is one of Damon Runyon’s first book appearances. Today Damon Runyon (1880-1946) is of course best known for his sports reporting and for his many stories of society’s colorful underworld and fringe characters. The broad “Runyonesque” patois of his stories was immortalized, after Runyon’s death, in the magnificent 1950 musical Guys and Dolls. 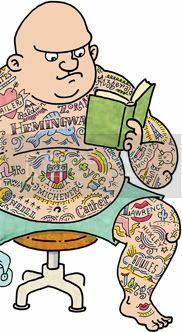 But his first two books were actually little-known books of poetry. 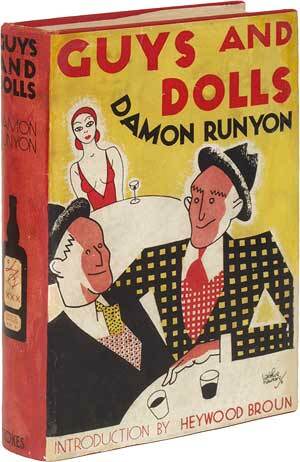 Runyon’s father was a newspaperman and Damon Runyon started writing for newspapers as a teenager. In 1898 he enlisted to serve in the Spanish-American War and was shipped off to the Philippines just after the war ended, where he spent several months before being discharged. In later years he claimed he was born in 1884, was only 14 when he served as the war’s youngest soldier, and had various battle exploits that never actually happened. But his experience of military life, his story-telling enthusiasm, and his appreciation of the poetry of Rudyard Kipling, all combined and led him to write a great deal of Kiplingesque, light-hearted military verse which was published in various newspapers and magazines prior to their being collected in his first two books (The Tents of Trouble, 1911, and Rhymes of the Firing Line, 1912). The book Matt was examining was a 1910 publication, Ninth Cavalry, U.S.A., a large book of photographs of African-American servicemen who were veterans of “Indian Campaigns, Spanish-American War, Philippine Insurrection, China Relief Expedition, now serving…” Whether Runyon knew any of these officers or soldiers personally is hard to say. But the book contains a prefatory poem, “Soldiers,” that is stated as having been “written expressly for this publication” by Alfred Damon Runyon. The poem describes a crowd’s peacetime enthusiasm and reverence for a military parade, and it makes a few specific allusions to African-American soldiers. Unfortunately, while there are a few biographies and literary studies of Runyon, there is no bibliography of his works. And there may never be one because tracking down his thousands of newspaper and magazine appearances over five decades would be the task of a lifetime. Like his good friend Walter Winchell, Runyon was first and foremost an active, working journalist. It wasn’t until the 1930s, when films started to be made from his stories, that he collected them in Guys and Dolls (1931) and other books. A couple of Runyon’s poems appeared in poetry anthologies prior to 1911’s Tents of Trouble, but what Matt discovered in Ninth Cavalry was not only one of Damon Runyon’s earliest book appearances, but also the first book to contain previously unpublished Runyon material. hey i was sent here by another surfer…is there a way to see this poem? i will Google it. Specifically i am looking to see if Runyon ever wrote about a “Ma Rainey” type black female singer character…or even a Dorothy Dandridge or Josephine Baker one…and if so what he called her. He is such a great namer and in a production of GUYS & DOLLS where General Cartwright is to be played by a black woman, i’d like to give the actress a pass in the opening “Runyonland” as an alternative opposite character…a singer in Harlem. Thanks if you can help!